Offset Project Operators (OPOs) may develop offset projects to achieve GHG reductions and removal enhancements in uncapped sources. Offset Project Operators may also designate an Authorized Project Designee (APD) to develop the project and interact with ARB and Offset Project Registries. 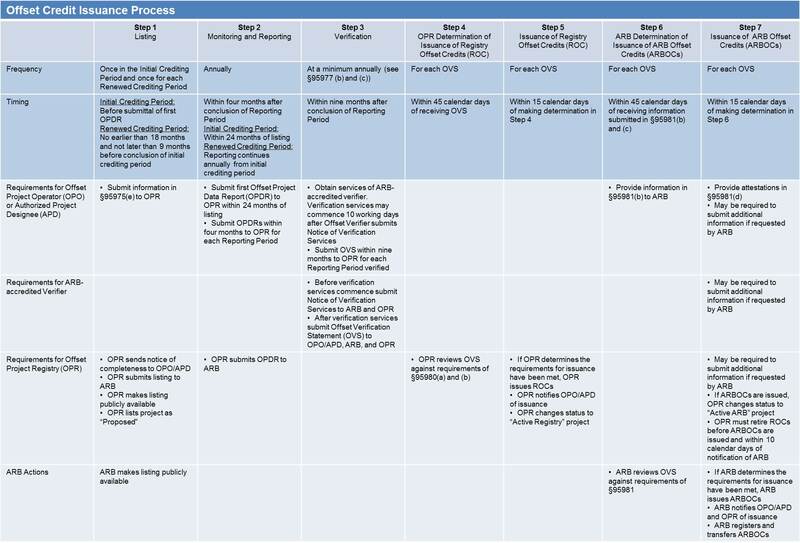 Offset Project Operators and Authorized Project Designees must use ARB Compliance Offset Protocols to quantify GHG reductions and removal enhancements, monitor, report, and verify their offset projects. OPOs and APDs must develop offset projects using an ARB-approved Compliance Offset Protocol. ARB has approved five Compliance Offset Protocols for use in generating ARB offset credits. ARB has developed general guidance on the compliance offset program which includes a description of the requirements that OPOs and APDs must meet under the Regulation. To be issued ARB offset credits, OPOs and APDs will need to submit information for listing, reporting, and issuance of offset credits. ARB will make forms available on the Compliance Offset Program Forms web page for ease of submitting these types of information. They can be also accessed on the web page of each Offset Project Registry.